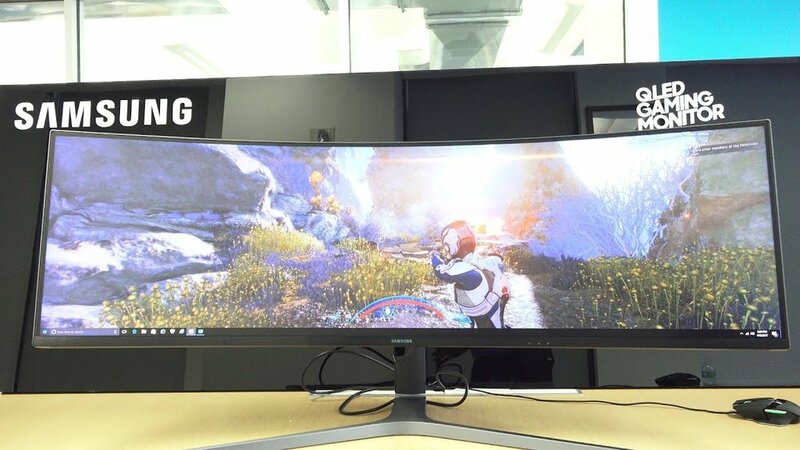 Samsung, the company that manufactures all things tech shocked the world this past Friday by unveiling the monstrous CHG90 ultra wide 49-inch QLED curved monitor, just imagine gaming, watching 4K video or even running spreadsheet software on this visual beast. Aesthetically pleasing to the visuals is not the monitor only attributes, there's some serious features and specs going on here. The CHG90 features a 32:9 aspect ratio an HD ready display that packs 3840 x 1080 resolution. The monitor is capable of supporting 125 percent sRGB color space, 95 percent DCI-P3 color space and can literally output 1.07 billion colors. Viewing angles are at 178-degrees, there is a insane amount of 1ms response time and a 144Hz refresh rate. The CHG90 is the first gaming monitor on the market that's implemented with AMD FreeSync technology for smoother game play without screen tearing or stuttering. This kind of technology is similar to what NVIDIA is running on most high end gaming monitors you have on the market. Lets face it, Samsung main consumer target are gamer's, the CHG90 is perfect for first person shooters flight simulation, and sports games such as Madden and 2K basketball. The CHG90 monitor is flooded with some impressive features, and lets not forget the 49-inch ultra-wideness that curves, the price though is rather costly at $1,499. You can right now pre order from Amazon, there is no conformation from Samsung on an actual release date, so stay tune.